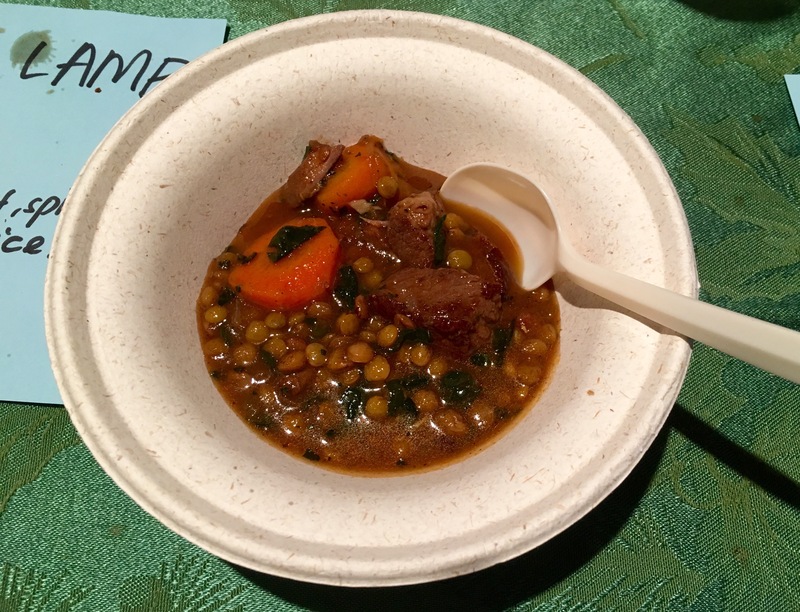 I made my Lebanese Lamb Stew in response to the “Sanctuary Soup” theme of celebrating immigrant roots. My paternal family immigrated to the United States from “the old country” (Syria/ Lebanon) in the first quarter of the 20th century. Like many families, my great grandfather went first and later sent for my great grandmother, brandmother (“Sitty” in Arabic) and great aunt(y) Mary when he was established in the burgeoning Syrian/ Lebanese community around Kanawha Street in Charleston, WV (strange, I know, but that’s where we ended up). Heat up approximately 1 tablespoon oil in soup pot. Season the lamb with salt & pepper and brown when oil is hot. Remove lamb, reserve in bowl. Dice onions, shallot & garlic, add to hot pot. Make sure to get the lamb bits in the onions. Cook until soft. Re add the meat, and add spices to pot. Cook for a minute or two, stirring entire time. Stir in tomato paste, diced tomatoes, carrots, chicken broth, water, and fresh thyme to pot. Bring to boil and the reduce to low and cook for 1 hour. Next add lentils to soup & cook for 15-30 minutes (until lentils are finished). Finish by mixing in spinach and adding any additional spices/ salt to taste. © 2017 Soup and Bread. All Rights Reserved.